This brief describes the development of a new model for realistically characterizing solution-diffusion transport mechanisms in polymeric membranes that are used for separation and purification of organic solvents. Polymeric membranes used in these environments, if not selected appropriately, undergo excessive swelling and compaction resulting in lowered performance or membrane destruction in the long-term. This brief describes the relationship between key parameters from a chemical, mechanical and thermodynamic perspective. 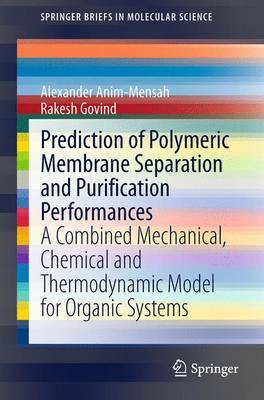 Moreover, the authors show how this new model points membrane manufacturers, scientists, and engineers towards an understanding of how these key parameters are considered in (1) designing and manufacturing membranes for the right application, (2) designing the right test experiments to determine the long-term membrane behavior in a short time, (3) minimizing the number of experiments to determine a reliable membrane for an application and (4) selecting the right membrane with higher level of certainty. The overall benefits of the model includes saving money and time. A simplified version of the model is included to assist the reader.